In case of an emergency, these systems require that the communication between the end devices remain in a constant state of readiness. Like in this application there is a simulation of a tunnel accident with the consequence of a fire. The fire produces smoke which is extremely dangerous in a tunnel because it rapidly limits passenger's view and even worse, it can cause the passenger's suffocation. The application represents a typical tunnel setup with ventilation components responsible for preventing the smoke and fire to expand. Smoke detectors placed along the tunnel's ceiling sense the smoke and subsequently the ventilation hatch directly over the source opens and exhausts the smoke. The neighboring ventilators then press fresh air into the tunnel. This clears the tunnel from smoke and contains the fire in one spot so that rescue forces can work their way through the danger zone. See a demonstration of this scenario in the application lab. The High-availability Seamless Redundancy (HSR) protocol suits this application well due to its ring structure. 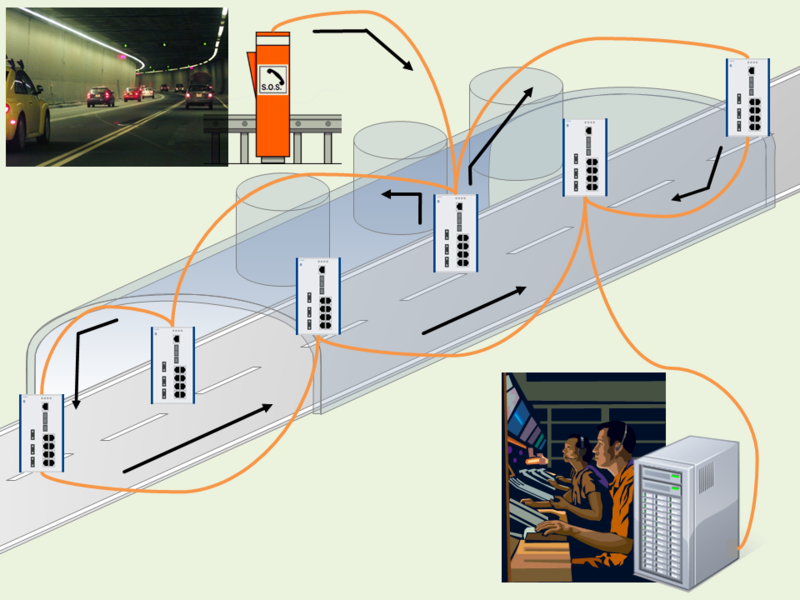 One would expect a network inside a tunnel to be alligned in a line topology, but this is not the case. Especially when facing safety-relevant applications it is necessary to implement redundancy protocols. As mentioned HSR is based on a ring topology and similar to PRP it also utilizes duplicated packets to deploy a seamless redundancy. This feature is only available on RSP and at the moment allows bandwidths of 100 Mbit/s. 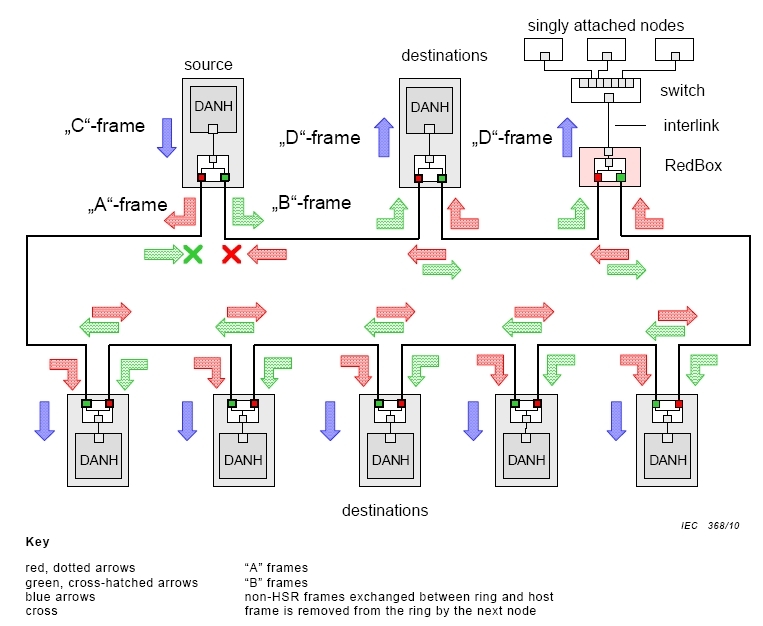 The duplicated packets are forwarded on two links in the ring until the first packet reaches the destination. Second packet reaching the destination is dropped by the corresponding RSP. This guarantees an uninterrupted communication since one of the two packets reaches the destination even if a link breaks.